Pen-and-ink drawing of sections of the fort at Sidhout (Siddhavatam) by Thomas Fraser (1776-1823), c.1802. 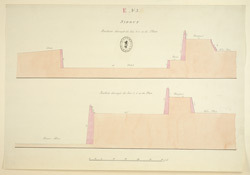 This is one of a series of plans and drawings completed by Fraser, c.1802 when he appears to have been inspecting and surveying forts in the Ceded Districts of Bellary, Kurnoo, Anantapur and Cuddapah. Sidhout Fort is located c.25km to the east of Cuddapah town in Andhra Pradesh. The fort was built in c. 1303 but was severely damaged when it was attacked by Hyder Ali (c. 1722-1782) in 1770. There are two majestic gateways to the west and east of the fort and a main gateway with pillared and artistic carvings of Gajalakshmi at the top.